Do you love hunting for Mid Century finds? If so, we'd love for you to share your own finds with us! This is the first of a regular new column, we will post our own finds from the weekend every Monday morning, and will also host a link party. We'd love to invite you to do the same! One of our favorite things about working in the vintage community is the great camaraderie and friendships we have formed with other bloggers, shop-owners, and vintage lovers. We look forward to creating that sense of community here as well! At the bottom of this post, please link to a blog post (with pictures) of your most recent (mainly mid-century) finds. We'd also love it if you would link back here and help us spread the news of this new link party. We are committed to posting every week, Monday morning. We look forward to seeing you here every week! Since we now have space in two stores, oSmalls have been selling well at both VDC & Hawthorne Vintage so I was keeping an eye out for smaller household items. 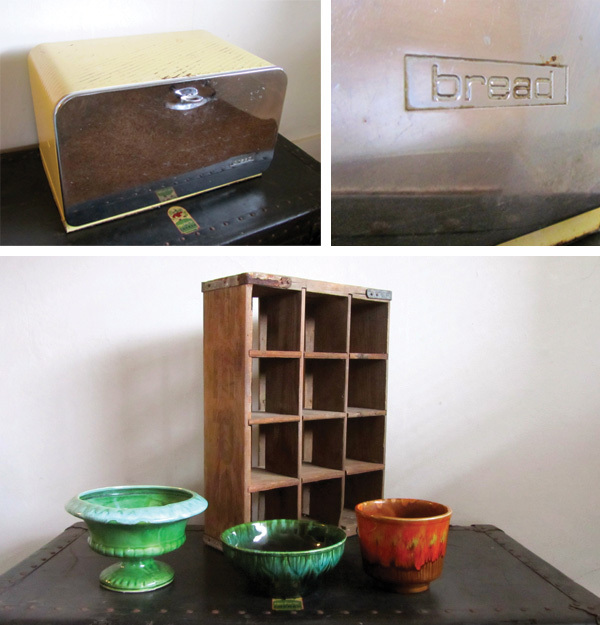 Here are some of our finds from a flea market and sales from the past week. 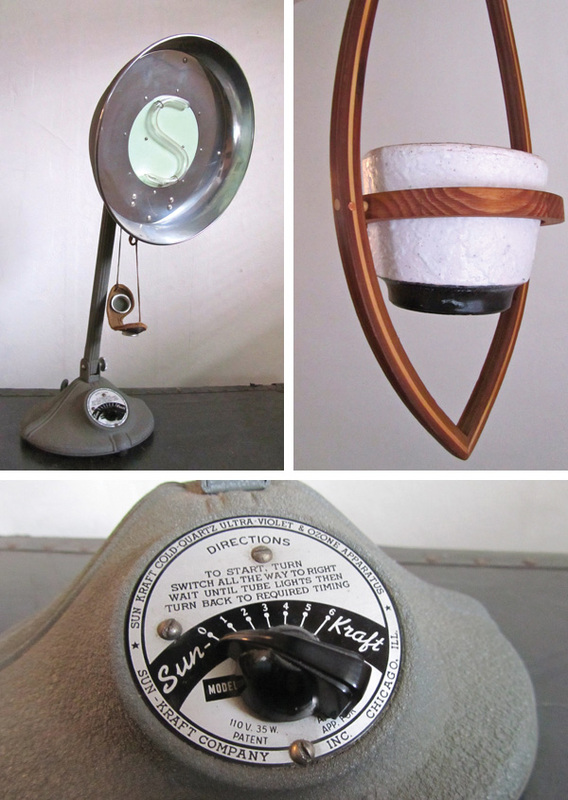 Chris' favorite find of the weekend was this Sun Kraft UV lamp. It will soon be rewired for an incandescent bulb to be made into a lamp. My (Heather's) favorite find is this wooden hanging plant holder. I'm going to save this until we find the perfect red or orange pot to use with it. A few other decorative pieces that we'll put in our spaces. Lastly, this beautiful green and gold glass bowl caught our eye. 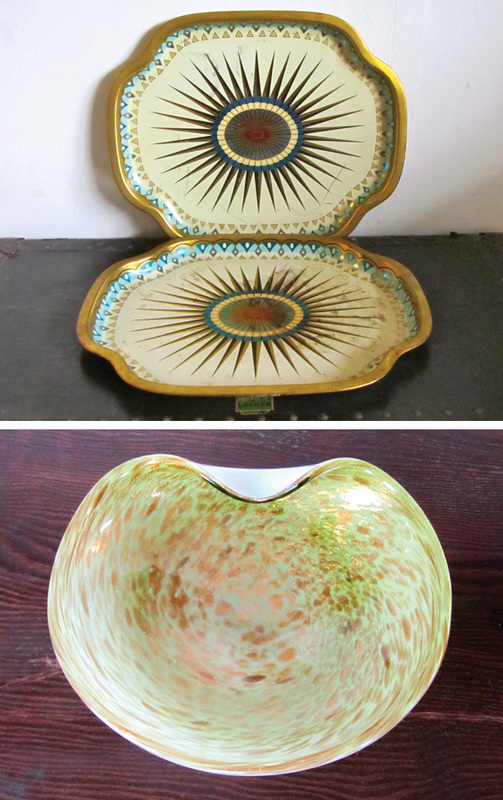 Chris has been researching, he discovered that it is a vintage Murano Bowl, we decided to list it on ebay. So excited for another vintage link-up! Love all your finds, but the hanging plant holder is my favorite, too. Inlinkz recommends not editing posts once they are published with their link thing in it, so I can't add a link in our post back to you guys this week, but I'll definitely add a link to our list of fellow link-ups next week! 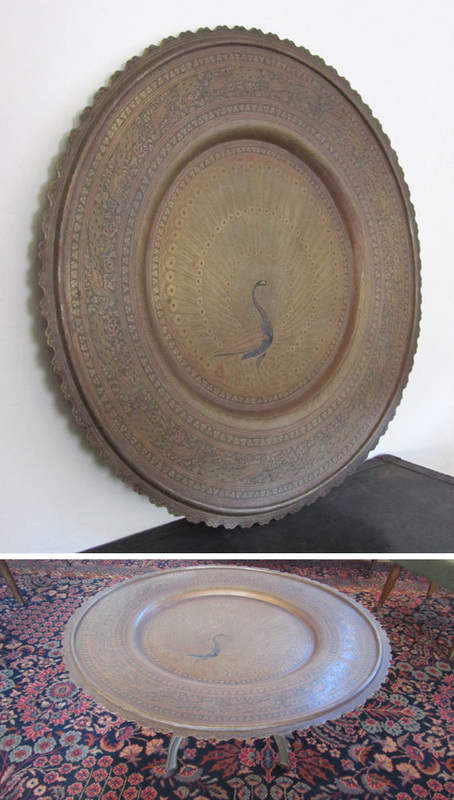 That Moroccan coffee table is amazing! Love the Murano bowl. And count me in for a mid-century linkup when you have one again. Thanks for stopping by the blog and voting on a masthead. Appreciate it!